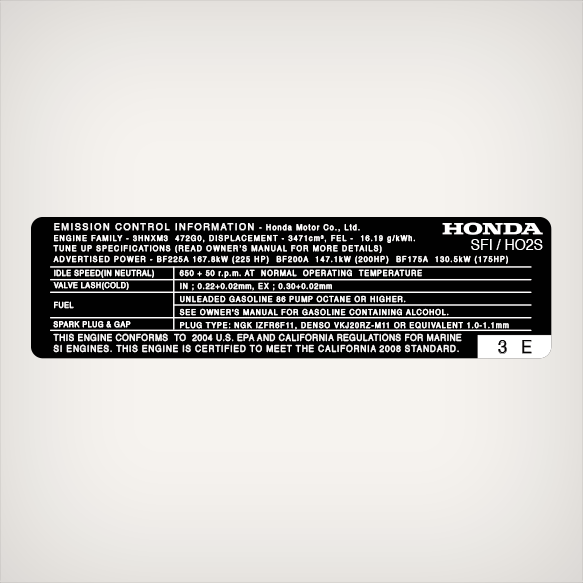 Honda SFI/HO2S Emission Control Information 3E Decal replica as seen on a 2004 Honda BF200 Outboard. FUEL - UNLEADED GASOLINE 86 PUMP OCTANE OR HIGHER. SEE OWNER'S MANUAL FOR GASOLINE CONTAINING ALCOHOL. THIS ENGINE CONFORMS TO 2004 U.S. EPA AND CALIFORNIA REGULATIONS FOR MARINE SI ENGINES. THIS ENGINE IS CERTIFIED TO MEET THE CALIFORNIA 2008 STANDARD.